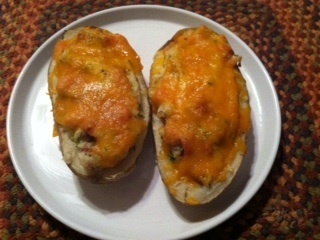 Twice Baked Goodness (and Sunday Soup)! We all love a baked potato – but how about a twice-baked?? (I know, nothing new, but everything old is new again.) Funny how foods are in fashion – then you don’t think about them for a while. Here’s the perfect potato side – with all its cheesy deliciousness! Bake 4 potatoes as you would normally, or microwave them on high covered with a damp paper towel for 12 minutes, re-arranging after 6 minutes. After they cool, slice them across the middle and scoop out the potato meat, leaving about 1/4 inch of potato in the skin. Heat a pat of butter (2 tsp) and 1 tsp finely chopped garlic in a saute pan for about 30 seconds. Pour in 1/2 cup milk and bring to a simmer (not a boil). Pour over the potato and mash together with a handful of sharp cheddar cheese, some chopped bacon of ham, some chopped chives or fresh parsley – or anything else you want. Scoop the mashed potato mix back into the shells. Sprinkle with some additional cheese and bake at 450 F for about 8-10 minutes until golden brown. Top with some sour cream – and you’ve got a spectacular side! It was a cold (for San Diego) and rainy weekend, so I stocked the freezer with some of my favorite staple soups. You can always find a variety of home made soups in my freezer – and now we’re fully stocked up again! 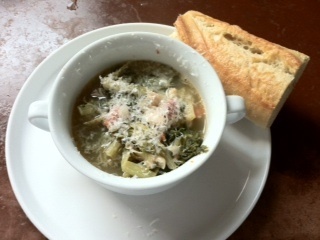 Minestra – This is an escarole and white bean soup that’s nutritious and delicious. Check out the recipe in an earlier post (in the Soup/Salad category). (Click link for recipe) This is the best – and makes about 5 quarts. I roast a couple of bone-in chicken breasts (Olive Oil, Salt, and Pepper) at 375 F for about 45 minutes and when they’re cool, shred the chicken into the soup. Hearty and oh-so-good! (Click link for recipe) The mix of flavors with artichoke hearts, chicken, and cannellini beans is amazing – this soup won’t disappoint!